Im new to the coin world. I aquired this coin a year ago, Just reacently i finally identified what it was and where its from. as well I discovered it was concidered a rare coin. Need to sell so im looking for advice on value, and opinion on its condition and what grade they consider it to be. There were many fakes of this series. A larger detailed photo would help. So Bill, can you tell us (that don't have a clue what year or value) what this series is and why there would be many fakes? I have 2 friends that specialize in Chinese and Far East coinage and won't touch them. For over 100 years the official coinage has been copied/faked, so that very few dealers (except those who specialize) will buy any of these Yaun(dollar) or 1/2 yaun(50 cent) coins. With computers and new dies, the situation is much worse. Without better photos and specific size/weight, it's hard to tell what's fake or what's not on a computer screen. 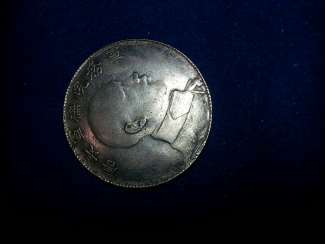 Your coin appears to be "restruck imperial coinage" that are rein-dated 1875-1908, but were restruck at intervals from 1911-1949 using old dies, and gradually reducing the silver purity of the original coins(.850). I'm guessing that it's Krause Y#480 at the start of the "Republic" coinage. 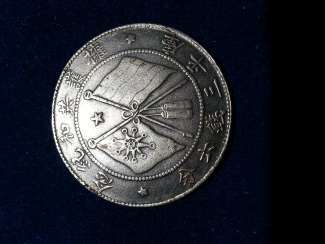 Since 2000, almost ALL Chinese old silver coins of the larger denominations have been CAD-CAM'd produced using laser-etched dies to resemble the old dies. As Shylo stated "It has 11' pole marks all over it". Thanks for the information Bill!